The Seymour Marine Discovery Center is a great place to learn about the ecology of the Monterey Bay National Marine Sanctuary. Henry V marks Artistic Director Marco Barricelli's return to the SSC stage. The performances of this classic Shakespeare work will crown SSC’s three-play exploration of Hal from a ne’er-do-well prince to fabled king. The newly expanded and renovated McHenry Library has everything going for it -- a beautiful natural setting, a sense of tranquility, plenty of natural light, quiet study areas, an impressive collection of books, and even a brand-new eatery located near the main entrance. UC Santa Cruz does not shut its doors, cover itself with plastic wrap, and put itself in cold storage during the summer months. The scenic campus remains vibrant and inviting in summer break, with a large number of attractions, sites, and programs for visitors. When the summer fog rolls in, UC Santa Cruz and its off-campus facilities roll out a long list of things to do and see, from artistic creations to al fresco Shakespeare in the redwoods to the mysteries of the deep. 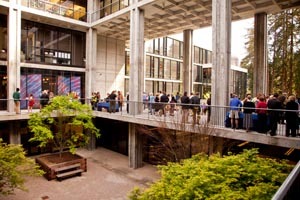 Summer is a good time to catch up with UCSC's unique art museums. The Mary Porter Sesnon gallery will host a lively exhibit highlighting the work of the latest Irwin Scholars through June 15. Each year, these 12 artists are handpicked by faculty to receive the most prestigious award in the Art Department at UCSC. Visiting the gallery is a great excuse to visit the lovely Porter College, which offers breathtaking views of the Monterey Bay and has a famous koi pond, great for picnics and contemplative moments. Over at Cowell College—which also features beautiful scenery and stunning views—the Eloise Pickard Smith Gallery, with a strong emphasis on art of the Monterey Bay region, is hosting Her Place: Visual Narratives by Bonnie Stone, an exhibition that runs through June 22 at UCSC's Cowell College. Stone, who lives in nearby Saratoga, has been producing vivid watercolors for more than five decades. The McHenry and Science & Engineering libraries house 1.3 million bound volumes, access to more than 12,000 periodicals, newspapers and special materials, along with special materials such as manuscripts, maps, and slides. And the new refurbishing and expansion of the McHenry library—complete with a new eatery close to the main entrance—makes this research and study space more appealing than ever. Most library resources are available to the public; borrowing privileges are available with a contribution to the Friends of UCSC Library or by joining the Alumni Association. Special Collections at McHenry Library contains rare, valuable and often fragile materials that do not circulate but can be viewed by appointment. For library hours visit the library website. Shakespeare Santa Cruz will offer something refreshing and thoroughly sylvan this season: instead of holding half its performances indoors at the Main Stage as usual, SSC will stage every performance outdoors in the famous Stanley-Sinsheimer Festival Glen, where audiences will enjoy Shakespeare's The Taming of the Shrew from July 23 through September 1; Henry V from August 6 – September 1, and Tom Jones (the Fringe Show) adapted from Jon Jory from the classic novel by Henry Fielding. Shakespeare Santa Cruz is a professional repertory company in residence at UCSC. Tickets may be ordered online or by phone at (831) 459-2159. You will be hard pressed to find any athletic training facility or full-service gym with a view like the one up at UCSC. Whether you're running a lap on the pleasingly bouncy half-mile track, or trying out some newfangled cardio machine in the Wellness Center, you will lose yourself in the scenery. If the workout doesn't knock you out, the view surely will. By purchasing a recreation/wellness card or paying a day-use fee, members of the community have access to UCSC's recreation facilities, which include tennis, racquetball, and basketball courts; wellness center; running track and playing fields. Prices vary. For information, call (831) 459-2531. Alumni Association members receive substantial discounts on cards and day-use fees. For information, call (831) 459-2530. The famous Arboretum awaits you this summer, but during your visit to UCSC, don't overlook other beautiful areas, including The Farm as well as the Alan Chadwick Garden. Visitors to the UCSC Arboretum may stroll through its exotic gardens, go on a tour or take part in scheduled events. 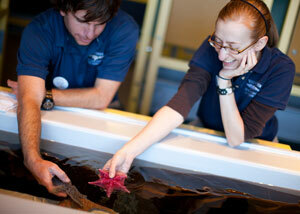 Admission is $5 for adults and $2 for children, and free on the first Tuesday of each month. Hours are 9 a.m. to 5 p.m. daily. Norrie's Gift & Garden Shop, a gift shop selling plants, pottery, jewelry and more, is open every day from 10 a.m. to 4 p.m. The Arboretum is located on Empire Grade between the campus's main and west entrances. Visit arboretum.ucsc.edu or call 427-2998 for more information. The Center for Agroecology and Sustainable Food Systems manages two locations: the 25-acre Farm near the main entrance to campus and the 2-acre Alan Chadwick Garden across McLaughlin Drive from Stevenson College. Both the Farm and the Alan Chadwick Garden are open to the public daily from 8 a.m. to 6 p.m. with a self-guided tour brochure available at the Farm entrance. Groups may sign up for docent-led tours. Visitors will see first-hand how to build fertile soil and control pests, recycle yard and kitchen waste, conserve water and encourage biodiversity. Special events and classes are scheduled throughout the summer. For more information, visit the CASFS website or call (831) 459-3240. Visitors can view one of the largest whale skeletons displayed worldwide, touch living sea stars and hermit crabs, and enjoy spectacular views of the Monterey Bay at the Seymour Marine Discovery Center, part of a UCSC marine research laboratory. Aquaria and exhibits feature the everyday tools of ocean exploration and focus on research done by scientists on site and around the world. Skillful docents answer questions and lead tours at 1 p.m., 2 p.m., and 3 p.m. Summer hours in July and August are Monday through Saturday 10 a.m. to 5 p.m., and Sunday from noon to 5 p.m. Admission ranges from $4-$6. The Seymour Center is located at the west end of Delaware Avenue in Santa Cruz. For more information, call (831) 459-3800 or visit the website. The public is invited to view exhibits in the main observatory building, built in 1888. Enjoy an informal talk about the observatory history while taking a look at the Great Lick Refractor in the 36-inch telescope dome. These talks begin at the gift shop on each half hour beginning at 1 p.m. on weekdays and 12:30 p.m. on weekends, continuing until 4:30. Each talk is 15 minutes long and is free of charge. Visitors also are invited to take a short walk to the Shane Dome to view the 120-inch reflector from the Visitors' Gallery. Displays explain the Shane reflector, one of the major telescopes used to discover planets outside our solar system. Special events also are scheduled, including a Music of the Spheres program, which takes place on June 15 and 29, July 13 and 27, and August 10 and 24, September 14 and 28. This promises to be a dramatic and stirring season for stargazers and music lovers. For more information, visit the Lick website. Reservations are strongly recommended; Music of the Spheres events tend to sell out quickly. For information, call (831) 459-4118.